It's about time, teachers, ... to revisit Higher Order Thinking Skills or HOTS. If you've been a teacher for more than 5 minutes, you must have some knowledge of Benjamin Bloom's Taxonomy of Educational Objectives. Did you know Benjamin is not actually the author of the taxonomy? It bears his name simply because he chaired the committee that developed it. So, the next time someone asks you to chair a committee, you may want to say "Yes." 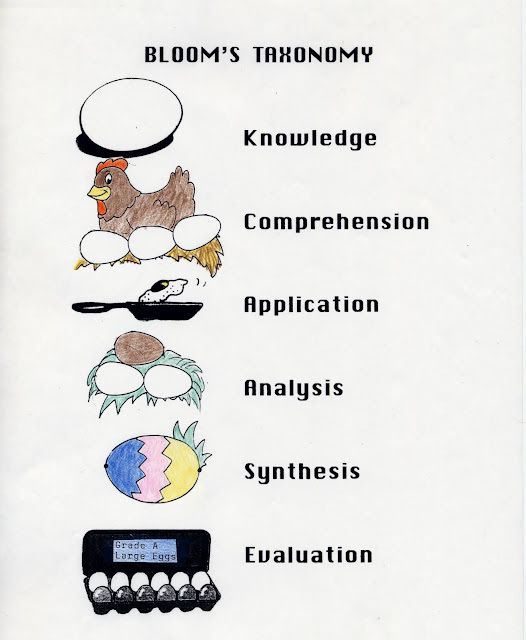 It seems like Bloom's Taxonomy has been around forever. Actually, it's been around since 1956, which for most of the educators at work today IS forever. It's been 56 years and it's still going strong. Although, it has morphed some over the decades. When 1st proposed, the taxonomy strove to deal with 3 domains of education: cognitive, affective, & psychomotor. The goal of the 3 domains was to produce holistic education. Over time, however, the cognitive domain has become the taxonomy we all think of when Bloom's Taxonomy is mentioned. In fact, each domain was to have it's own handbook, but after publishing the cognitive domain handbook, it took 8 years for the affective domain handbook to be written and the psychomotor domain handbook was never written! Too often, I think, the taxonomy is taught and used in educating gifted and talented learners. That may be a matter of practicality. The taxonomy is scaffolded; the lower levels must be broad and strong in order for the upper levels to be built. In an age of standardized testing mania, knowledge and comprehension, the foundation levels, are the name of the game. Since those are the most easily evaluated components, performance is naturally based on those levels. And so, I surmise that only the teachers of G/T have the time to work on the upper levels of the taxonomy since their students, presumably, have the requisite knowledge and understanding. Let's not dwell in the basement, teachers! It takes more work to bring your students to the upper levels of the taxonomy. The payoff, however, is well worth the effort. Who doesn't want to spend their time in the penthouse rather than the basement? Any student of the taxonomy knows that there are lists of verbs to help us remember how to incorporate each level into our teaching. While I am a visual learner, perusing those lists tends to make my eyes roll to the back of my head. So, I created the following visual to expeditiously remind me what each level should look like. I don't know if Easter eggs brought this to mind or the hatchlings that spring promises us, but I do know that teachers everywhere need to break out of their shells and push their students to work in the higher levels. Our children deserve to be grade A educated. Now I'll climb down from my soap box and get back to dyeing eggs. Thanks for this great info! Glad I found your blog. You're welcome and I'm glad you found my blog, too. Come back soon. I would rather spend my time in the penthouse! I love the analogy. I also like the graphic you created. I am a very visual person, so this really speaks to me. Great post! Thank you Jana. I really appreciate the feedback. I'm a new follower Barb~ You don't appear to be a newbie to me~ WOW,WOW,WOW! Thank you so much. I'm glad you're here. Hi Barb! 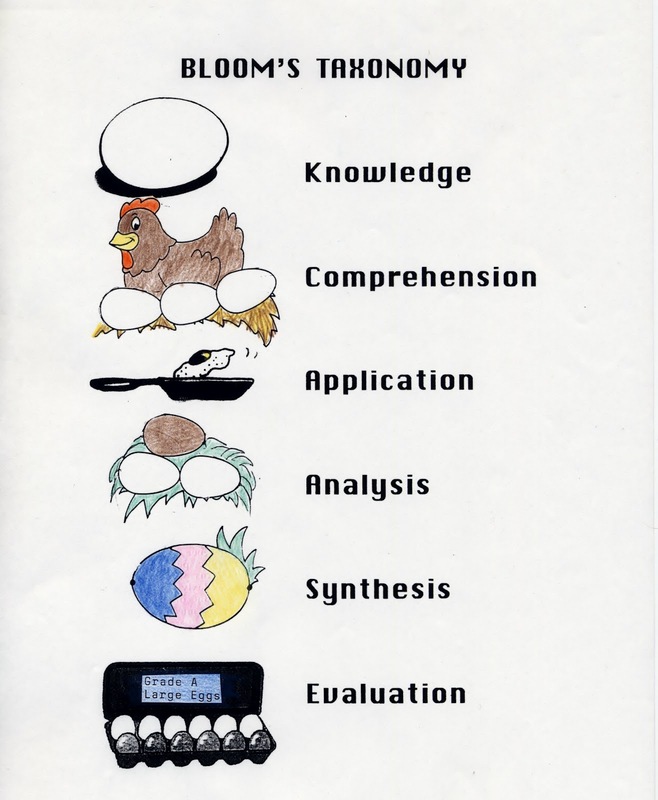 I love the chicken/egg example of bloom's levels! I also try to incorporate Webb's Depth of Knowledge and Marzano's Dimension of Thinking which to me are takes on on Bloom but interesting all the same! I am your newest follower! I love your example! Thank you! I would be honored if you came to visit me! I think the new version of Bloom's taxonomy is light years beyond the old. The old one doesn't even include creation, and if we're not coaching kids on how to express their thoughts...we're in trouble. To what degree do you think the second version has been adopted in education, Barb? In general. Patrick, Thank you for your thoughtful comments. I completely agree with the need for nurturing creation/creativity/creative expression. Certainly there are teachers who routinely promote those traits. Sadly, in this age of No Child Left Behind, wherein the bottom line is standardized test scores, there are severe instruction limitations forced on teachers by uniform time lines. That bottom line is always about the lowest levels of Bloom's Taxonomy, regardless of whether it's the old or new version. Moreover, with teaching success being based primarily on test scores, there is little motivation for teachers to push upward in the pyramids. So, in general, I think far too few teachers are adopting the newer version; worse yet, far too many give minimal attention to the Higher Order Thinking Skills. Okay, this goes back to an area where I've been paying a lot of attention to lately, teacher induction. From what I'm coming to understand, new teachers are told what they can and cannot do, because of standardized testing and all of the protocols set in place to enforce them. It seems teachers have lost their autonomy, which is ridiculous, because most teachers I meet have beautiful, creative, competent minds. So we're losing half of our beginning teachers by year five. How much do you think the culture of standardized testing has affected teacher attrition? There is no doubt that standardized testing plays a significant role in teacher attrition. Until relatively recently, teachers did enjoy creative autonomy. However, other contributing factors include status, compensation, and working conditions. Teachers are no longer respected by the general population, unlike other cultures, say Japan, where teachers are revered. In fact, teachers rank awfully low on most people's scale. After all, who couldn't stay ahead of a bunch of 6 year olds (grimace)and who else only works 75% of the year? Economically, teachers rank very low, as well. In my generation, it brought in a good 2nd income. However, teaching is loathe to pay the bills if it is the primary or sole income. Consider that I have more education than my sister-in-law; yet she earns a corporate salary well in the 6 figures, while I will never reach a 6 figure salary. Then there are the working conditions. In 34 years of teaching, I have enjoyed an air-conditioned classroom for only 10% of that time. So, pack 25 kids and 1 or more teachers into a room with 2 1' x 2' windows in late August when temps are generally in the high 90s in IL, and you have some miserable conditions. Conversely, in the winter, I have found it necessary to wear long underwear (TMI?) and even my coat when energy conscious school boards dial the thermostat down. There was even 1 year when my room had large, plastic garbage cans scattered thru-out due to leaks in the roof. This wasn't just for 1 day, mind you. It lasted for weeks while the roofing company argued that they had done nothing wrong. I do not teach in a low income area. The majority of my students came from the country club set. But this is the reality when lay people are elected to determine the fate of children and teachers.